Yesterday, I spoke with a former colleague (let’s call her Aura) who was diagnosed with cancer in early 2015 and had to take an extended medical leave from her job. Aura said that when she was first diagnosed, her friends, coworkers, and bosses all expressed their concern and sadness about her diagnosis and they promised to think positive thoughts and keep in touch with her. It was only a few weeks after Aura started her medical leave when she realized that that no one from her company had called or sent a message like they had promised to do. Aura said she felt lonely and forgotten, — she wished every day that someone, or anyone from her company would reach out to her. Aura had her surgery and treatment and she made a full recovery over 15 months. When Aura returned to work in early 2017, she was hoping to be welcomed back by her bosses and co-workers, not in a public way but in a more personal/caring way. Aura said she still felt hurt that not one of her managers had checked in to see how she was doing when she was on leave and it was not much different when she returned. Despite one manager and a few co-workers giving her a hug and welcome back it was business as usual. It was like she had never left, never had cancer, never was missed. All to say – I think Aura’s situation is very common place these days. We use the excuse that we are busy and that we will make that call or send that message tomorrow because we just don't have time today. We procrastinate, get side tracked and then we simply forget. We are consumed with our work and lives and we always think we will have another 'chance' to let someone know we are thinking of them. Sometimes that doesn't happen and we 'never see that person again. In other situations, falling outside of short or long term medical leaves, some employees require time off for family commitments and/or educational and professional development programs. Be flexible wherever possible. If employees have to go through red tape or an interrogation to get time off, they may resort to other tactics such as abuse of sick time or leave your company to work for another employer who is more flexible. 2. Show Respect — Expecting employees to come in early and leave late on a daily basis shows a lack of respect for their personal lives. Additionally, contacting employees after work hours or while they are on vacation should be avoided. Yes, there will be urgent situations when you will need to break this rule, but this should not be the norm. When employees realize that you don't care about them (from infringing on their personal time), everything you do regarding relationship building activities will seem superficial. Furthermore, respect is a must. 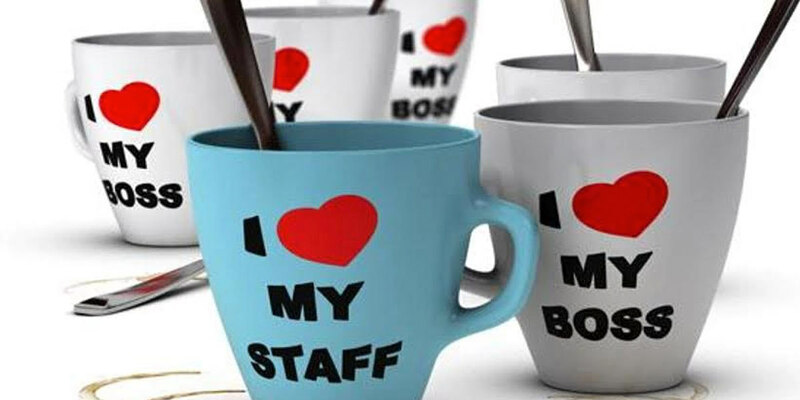 A good manager does not talk down to staff or make them feel inferior. Team members should not feel any pressure or feel intimidated to come directly to you. It is important for you to show respect for all those you come in contact with, including your cleaning staff, security people , mail carriers, delivery people, and any other people associated with your business. 3. Connect with your Team — Be visible and make your presence felt. Don’t just lock yourself in your office for the whole day and only communicate with staff via email or when you want something done. You cannot motivate your team when you are out of sight. Come out from behind closed doors to mix and mingle with your team. Join them in the lunchroom; get to know their interests, families, and friends. Be spontaneous when you can and build caring relationships. It only takes a few minutes a day. 4. Advocate for your people — Exhibit loyalty to your employees. In some cases, if a complaint is made against an employee, the manager is quick to jump in and suddenly all the good the employee has done is cast into the sea of forgetfulness. Don’t be the judge, jury, and executioner. Don’t throw your people under the bus; let them know you have their backs. Managers also lose credibility when they refuse to hold themselves accountable, point fingers, and palm the blame off on others. 5. Give your Employees Autonomy — Micromanaging and breathing down someone’s neck all the time can be very disheartening. Knowing when to step back and let your employees do their work is what they need. Give people responsibility and challenges that will help them to grow. Let them come up with ideas. When you empower your employees, it shows that you trust them and they will not want to let you down. 6. Be Fair and Neutral — We all know too well about office politics and favouritism. It’s really sad when employees can tell who will be getting the next promotion based on a manager’s relationship with some employees. Unfair work practices relate to how vacancies are filled, how discipline is enforced, and even how a leader allows leeway in work schedules. This fosters poor morale and low engagement. Give constructive feedback rather than criticism. Don’t give preferential treatment to some employees and ignore others. Everyone is watching and noticing more than you think. 7. Give Credit – Don’t Take Credit. — Don’t brush over your team’s successes with a bland acknowledgment while automatically working towards the next goal. Don’t ever take personal credit for your team’s ideas and work. Be generous with reward and recognition and “thank yous.” Recognize publicly. Rather than just recognizing top performers, include those who are improving or doing their best. Make the time to celebrate victories even if it is just a 5-minute gathering in the lunch room. Leadership is both a give and take relationship. If you want employees to go the extra mile, you have to go the extra mile, too. If you want loyal employees, then you need to show loyalty to them. Lead by example. Jennifer Grant International can help you to create an extensive tool kit on how you can show your employees that you care.